Bestselling writer Ales Kot (ZERO), artist Will Tempest, designer Tom Muller and letterer Clayton Cowles come together for an all-new thought-provoking suspense series that explores the ephemeral state of humanity in MATERIAL. The series launches from Image Comics on May 27. In MATERIAL, a man comes home from Guantanamo Bay, irrevocably changed. An actress receives an offer that can revive her career. A boy survives a riot and becomes embedded within a revolutionary movement. A philosopher is contacted by a being that dismantles his beliefs. Look around you. Everything is material. "Making Material keeps me sane,” confessed Kot. “It's a story that begins in America and spreads everywhere. It defies easy categorization. Our chief aim is to be truthful about LIFE as it is NOW through a vast VARIETY of explored HUMAN EXPERIENCE. Material also marks the return of 9-panel grid as a standard tool in a comic series. Expect backmatter files by excellent artists, writers, journalists and other beings. Expect new readers coming to comic book stores asking for it. Ideally, Material will be our 'Cerebus'—in that we intend to keep this one going for a long, long time." 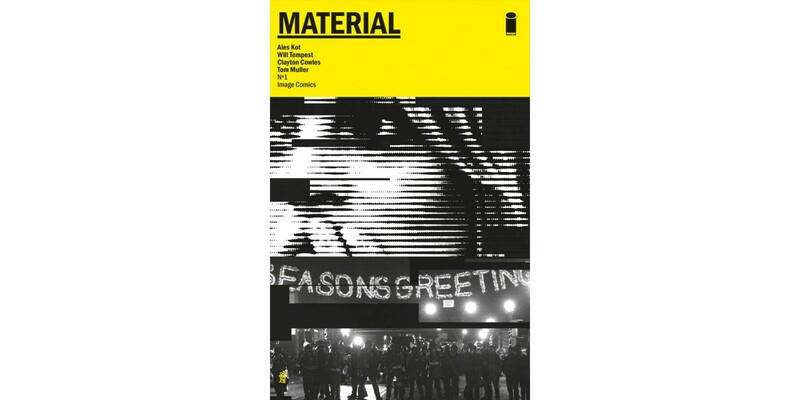 MATERIAL #1 hits stores on May 27 and can be pre-ordered with Diamond Code MAR150477.